In our Beauty Street Style series, we find inspiring women around New York City and get the secrets to their look. This week we met Mia, a mother of two, whose striking hat caught our attention while we were walking around SoHo. Only after Googling her name did we discover that she played Matthew Broderick's on-screen girlfriend Sloane in 1986's "Ferris Bueller's Day Off." Naturally we freaked out. Still incredibly stunning after all these years, no? When we asked about her beauty routine, her secret was simple. 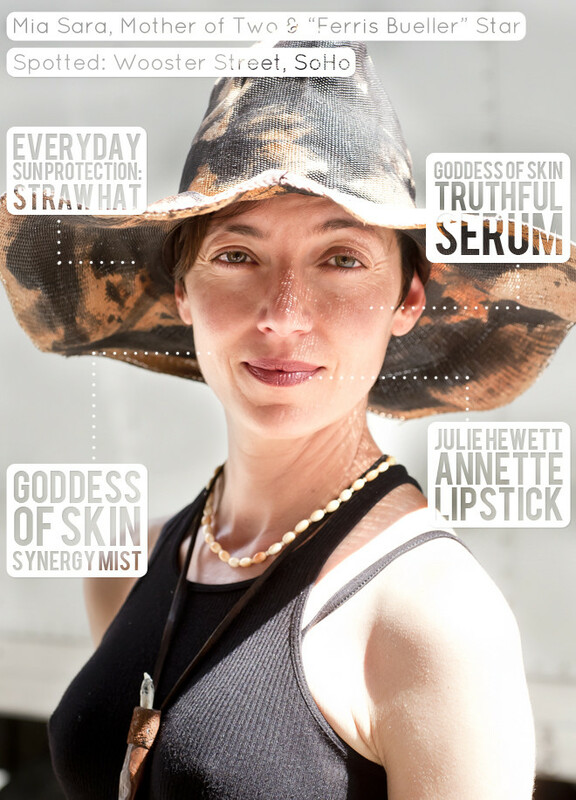 "To keep your skin looking healthy and young, wear a hat." It's a no-brainer, but also one of the smartest sun protection and anti-aging tips out there. See the rest of her beauty essentials below. Click through the gallery to shop Mia's beauty look, then check out previous Beauty Street Style real girls.